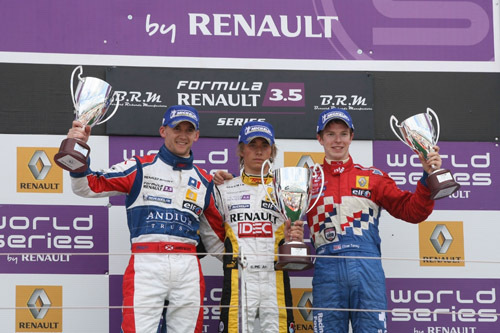 There were two podiums for BRDC Members in the first Formula Renault 3.5 race of the World Series by Renault weekend at Silverstone with BRDC Full Member Fairuz Fauzy taking second and BRDC Superstar Oliver Turvey taking third. Fairuz, BRDC Full Member James Walker and Oliver all gained a place when Daniil Move ran across the grass on lap four. And mid way through the race a mistake by Bertrand Baguette saw Fairuz move in to second while Oliver was able to move up in to the final podium spot. Oliver also took first place in the rookie places while BRDC Rising Star Brendon Hartley was second on the rookie podium and fifth overall. Just ahead of Dylan was BRDC Full Member James Walker. In yesterday’s feature race, once again there were two BRDC podiums with Full Member James Walker taking second while Oliver Turvey recorded another third place and first in the rookie classification. BRDC Rising Star Brendon Hartley slotted into second ahead of James with Oliver fourth just ahead of BRDC Full Member Fairuz Fauzy. After the pit stops James was third ahead of Oliver and Fairuz while BRDC Rising Star Greg Mansell was 13th, Brendon 14th and BRDC Rising Star Jon Lancaster 16th. With James and Oliver on the podium, Fairuz finished fourth with Brendon 13th and Jon 15th. BRDC Full Member Rob Huff celebrated another visit to the World Touring Car Championship podium in Porto at the weekend as he finished second in the first race at the Portuguese circuit. Double WTCC champion Andy Priaulx finished the first race in ninth while regular British Touring Car Championship driver James Thompson was another BRDC Full Member in the field finishing 18th in a Lada. In the second incident packed race, Rob was once again the highest placed British driver in sixth place, just ahead of Andy while James finished 15th. BRDC Full Member Justin Wilson has taken what he’s described as ‘the most important victory of his career’ in the Indy Racing League at Watkins Glen. Justin’s victory was the first for his Dale Coyne Racing team. BRDC Full Member Ryan Briscoe finished second for the fourth time this season while BRDC Full Member Dan Wheldon finished in tenth place. Runner-up from the last race, BRDC Full Member Dario Franchitti, was 15th having spun on lap 23. In the Firestone Indy Lights Championship BRDC Full Member Stefan Wilson came home in 12th place at Watkins Glen. BRDC Full Member Piers Johnson was victorious in the first British GT Championship race of the weekend at Snetterton. Also on the podium was BRDC Full Member Martin Short in third place, just ahead of fellow BRDC Full Member Mike Wilds. Aaron Scott finished the first race in seventh in the Viper just ahead of another BRDC Full Member, Michael Bentwood. In race two Martin Short was back on the podium having taken the Mosler 900 to another third place with co-driver Daniel Brown. Michael Bentwoon was sixth and Mike Wilds tenth in the Ferrari 430 Scuderia. Aaron Scott was not classified in the last race.